Shang-Chi: Master of Kung Fu, Doug Moench and Paul Gulacy, Marvel Comics, 2004 (c2003), ISBN 9780785111245, 144pp. When I became a certified comics fan in the late 70s, there were two comics outside of the “mainstream” superhero fare that I loved. One was Howard the Duck, a satirical comic about politics and society. The other was a comic about family, albeit one in which the father was the ultimate evil and the son had been raised to be the perfect assassin, who then rebelled against his father. Of course, Master of Kung Fu also had the big action sequences as well as secret service intrigue as well, but I suspect it was that idea of the son not exactly wanting to follow in his father’s footsteps that a psychiatrist would have a field day with if I ever found myself on the couch. Marvel’s recent successes on the movie screen along with the burgeoning market for graphic novels has them looking to the past for their future. They also, obviously, believe that since the audience that grew up on these comics are older, that such audience also wants their return to be “mature” as well, and to that end Marvel has a new line of comics called “MAX” to distinguish comics with “mature” themes. I’ve only read two of the MAX titles–the original creators returning to my favorite books, Howard the Duck and Master of Kung Fu, and I’m starting to think ol’ Thomas Wolfe was right, and you can’t go home again. It’s not that Master of Kung Fu (subtitled “The Hellfire Apocalypse”) isn’t well done. Moench and Gulacy are a wonderful team and the intervening years have not diminished their ability to portray in flat panels the fluidity and excitement of a martial arts epic. But something is missing, and I think it’s the cliffhangers and surprise of the monthly comic. 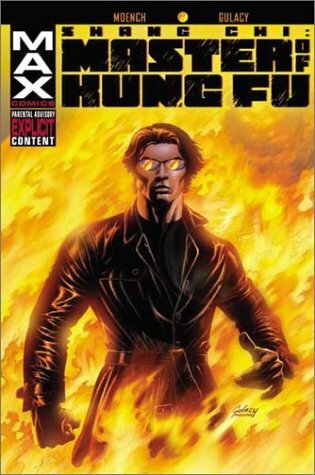 Collected together in this graphic novel, the monthly wait to see just how Shang-Chi, Weiko Lu, Clive Reston, and Black Jack Tarr were going to get out of this dire calamity is gone. But even then, it wasn’t that cast, nor Fu Manchu, that drew me to the comic, but the ancilliary ideas, just as it isn’t James Bond or Blofield that brings you back to 007, but the gadgets. “The Hellfire Apocalypse,” although it tries hard, is warmed over kung fu–there’s nothing in this book that we haven’t seen time and time again since Moench and Gulacy took their leave of us 20 years ago. It makes me wary to re-read any of those 1970s/1980s originals, to see if my memory has failed me and that those comics weren’t as great as I remember.